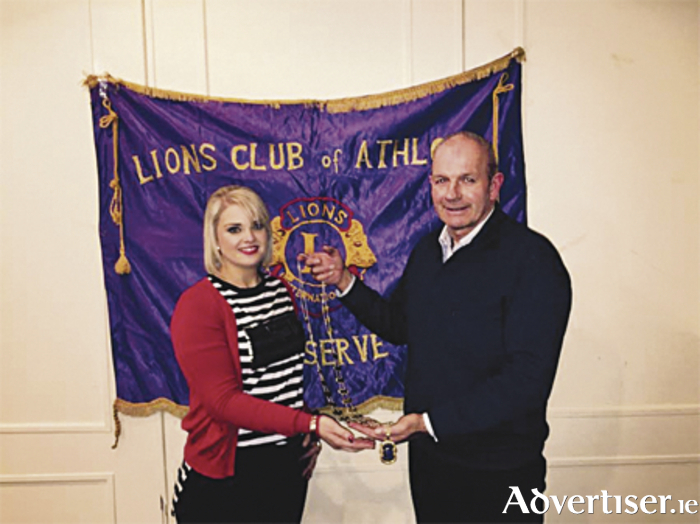 Nicola Waldron has been appointed president of Athlone Lions Club. Ms Waldron was presented with the chain of office by outgoing president, Michael McDonnell, at a recent meeting. The Athlone Lions Club was formed in 1976 and is part of Lions Club International, which is the world's largest service club organisation. Lions are an international network of more than 1.5 million men and women in more than 46,000 clubs in 206 countries, who work together through selfless effective community service to answer the needs that challenge communities. As a member of a Lions Club, you become aware of the needs of your community and have the opportunity to make a difference. Being a Lion empowers you to help others in a way that no one person could do alone. Since 1976, Athlone Lions Club has contributed greatly to the local community both financially and practically. The funding of the charity account is raised by running various events throughout the year, and all revenue raised goes directly to deserving causes. If you think you have something to contribute to Athlone Lions Club call (090 ) 6474013.